The performance moving stones, commissioned by Borobodur Writers Festival, is specifically created for a performance in front of the Mahayana temple Borobodur, the world largest Buddhist temple situated in Central Java, in the recency Malang, Indonesia. positioned along a straight line from Borobodur. A ritual relationship between the three temples must have existed, although the exact ritual process is unknown. 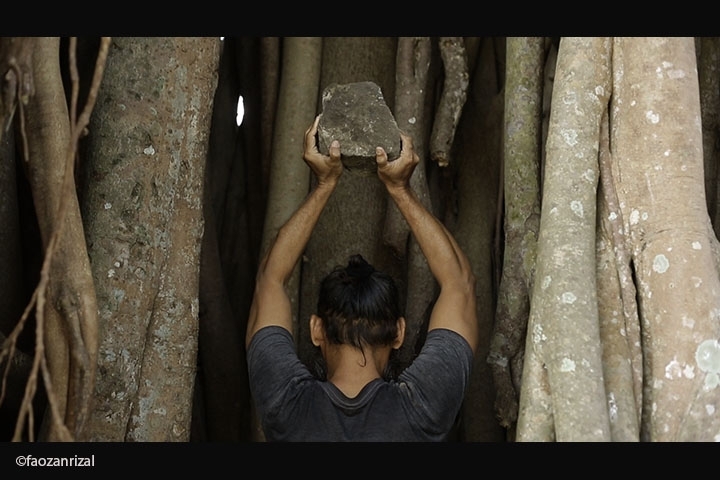 MOVING STONES is inspired by this imaginative line between the temples Borobodur, Pawon and Mendut and is exploring the concept of migration within the relationship of these three temples. The three temples are built from stones. The stones are moved within the region with tremendous effort to construct the temples. 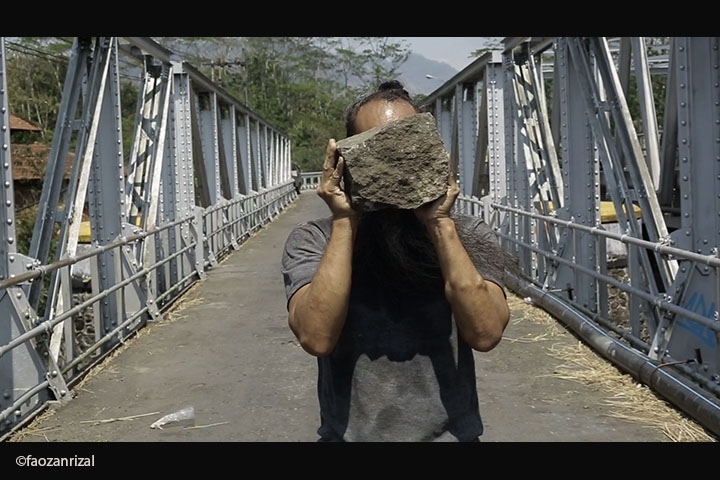 The performance installation MOVING STONES is based on a film of the performer Tony Broer, walking from Mendut, Pawon to Borobudur and carrying one stone with him. 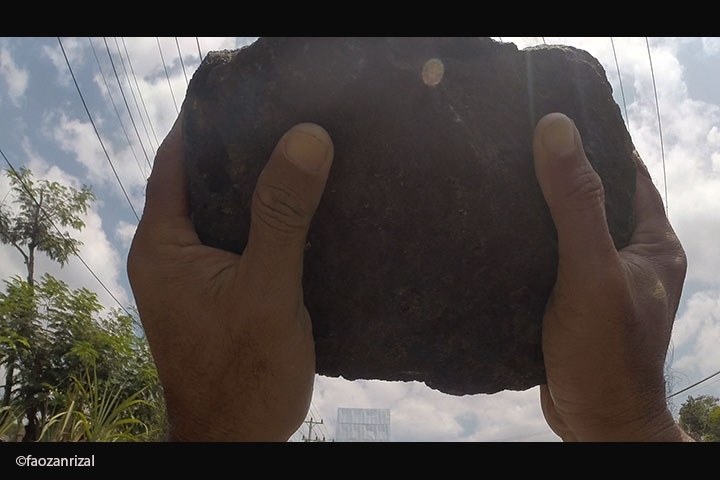 The stone is a metaphor of the effort of migrating people in their search for a new home while leaving the own home behind. Tony Broer is walking the shortest possible path connecting the three temples through forests, rivers and rice fields. 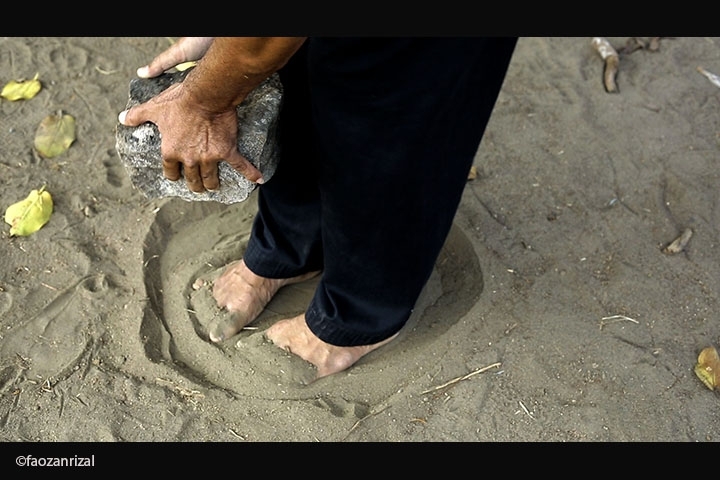 On the way, he is building small towers of stones, leaving them behind, coming back in order to leave again with always one stone in his hands. His journey is documented through two cameras: one camera shows Tony Broer as a wanderer from the perspective of an outside observer. 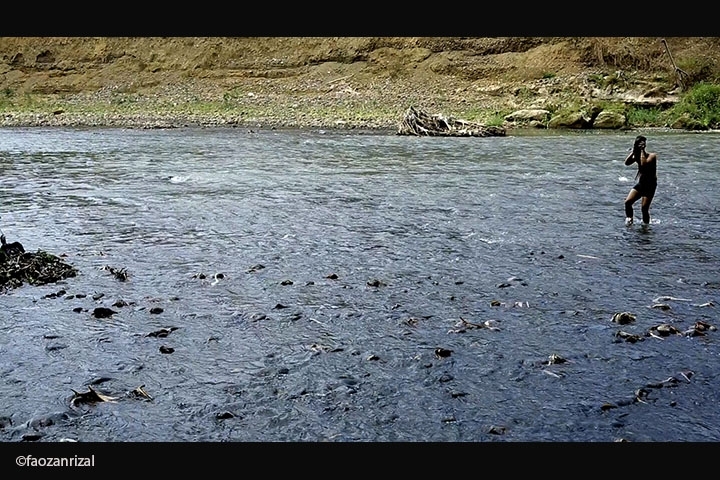 A second camera shows the perspective of the wanderer him self, how he perceives the landscapes and situations he is going through. The film, a collage of the two camera perspectives, is projected in small scale on a on the tip of a triangular stage setting. 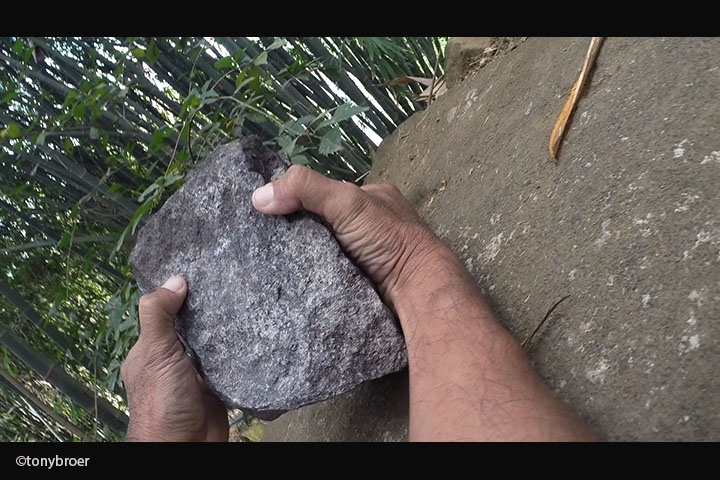 The performance MOVING STONES is evolving through the interaction of the performer Tony Broer between the projected film, which reflects on his journey, and stones of different sizes lined out in the performance arena. He is constructing and deconstructing, approaching and leaving behind. It is a contemplation between the place left behind and the place to be found, between the hope for a new and better place and the questions which might arise upon arrival. What is the embodiment of arrival? How do we know that we arrived?